Here is a list of Firefox plugins that I regularly use. I strongly recommend each of these add-ons. I use these to keep a check on the websites that can track me. Most of us might be of the impression is that "I do not have anything to hide, so I should not be worried about privacy." But the question here is not about hiding something, the question is "Why should anyone be interested in what you do?" 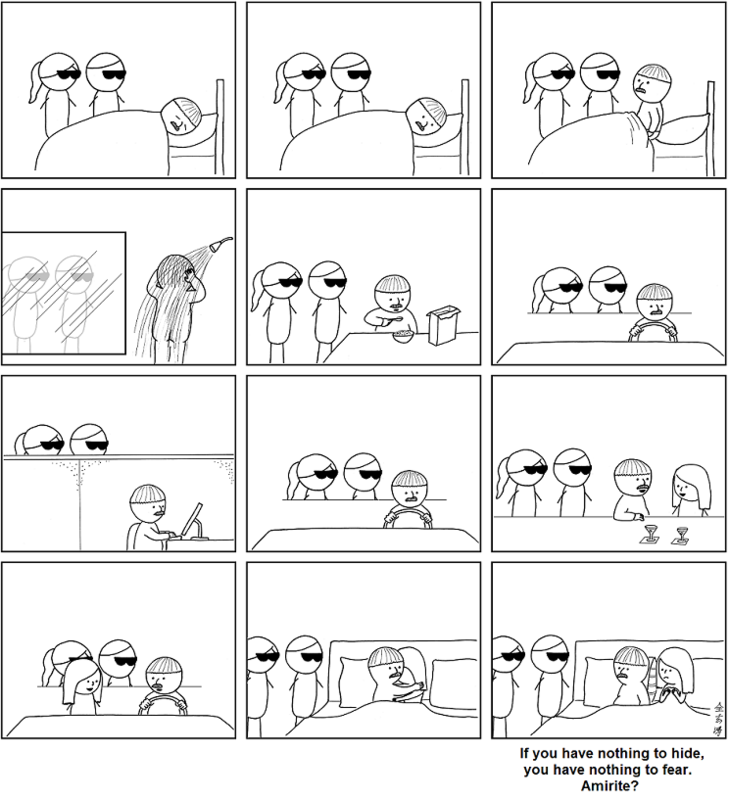 Have a look at this cartoon strip from Abstruse Goose; it should give you an idea as to why privacy is important. The list of add-ons I use to track (to some extent) my privacy are as follows. ShareMeNot: This is a very useful plugin that ensures that sites like Facebook and Google are not able to track the pages you visit even if you are currently logged into sites like Facebook and Google. Sqlite Manager: It is a nice firefox add-on that provides a GUI for SQLite databases like the ones used by Firefox. It shows all the data that is saved by Firefox. Collusion: This add-on provides the list of sites sharing your information and the list of sites that are accessing your information from these sites. It can be a bit scarry if you do not close Firefox for a long time as this graph builds on with time. Firebug: This is a really nice add-on that helps me inspect the page elements. I use it to see from which websites I am receiving data and pushing data. It is also really helpful when creating webpages and checking if the page you created is W3C compliance. I used this while creating my homepage at INRIA. I do not use and I would not recommend add-ons like Adblock-plus because advertisements are the source of revenue for the sites providing their services for free. For example, there are a couple of newspapers, bloggers, comic strips, and other artists that rely on revenue from ads.